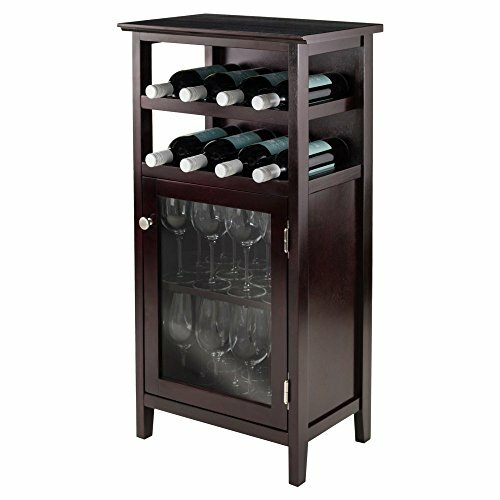 Ancona Modular Wine Cabinet with Glass Rack and 20-Bottle made from both solid and composite wood in Espresso Finish. The Winsome Ancona Modular 24 Bottle Wine Cabinet with One Drawer and Stemware Rack is a storage-rich furniture piece that can hold all of your wine tasting essentials in one beautiful wood cabinet. 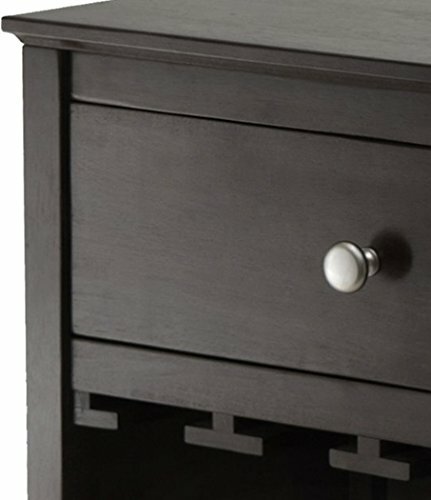 Traditionally styled in wood with a dark espresso finish, this cabinet contains both a storage drawer and stemware rack, and can hold up to 24 wine bottles at a time. About Winsome Winsome has been a manufacturer and distributor of quality products for the home for over 30 years. Specializing in furniture crafted of solid wood, Winsome also crafts unique furniture using wrought iron, aluminum, steel, marble, and glass. Winsome's home office is located in Woodinville, Washington. The company has its own product design and development team, offering continuous innovation. Constructed from long-lasting wood. 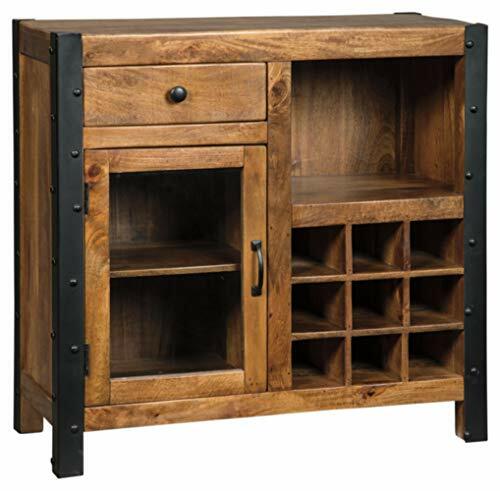 Accommodates 24 wine bottles. Comes with a storage drawer and stemware rack. 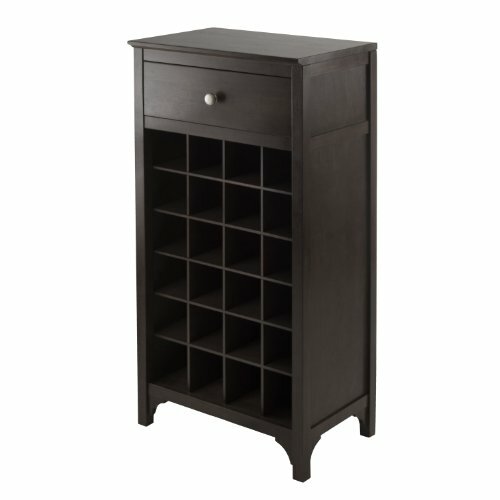 Traditionally styled wine cabinet in dark espresso finish. Dimensions: 19.09W x 12.6D x 37.52H in..
Dimensions: 19.09W x 12.6D x 37.52H in. Brand: Winsome | Manufacturer: Winsome Trading, Inc.
Classic yet contemporary, the Winsome Alta Wine Cabinet holds eight bottles of wine along with two dozen glasses or other essentials. The lower section of this cabinet features a glass door with one shelf that neatly divides the storage space. Racks above cradle your bottles horizontally. The rich espresso finish complements a variety of settings for an upscale look that's somewhere between traditional and contemporary. Winsome Trading has been a manufacturer and distributor of quality products for the home for over 30 years. Specializing in furniture crafted of solid wood, Winsome also crafts unique furniture using wrought iron, aluminum, steel, marble, and glass. Winsome's home office is located in Woodinville, Washington. The company has its own product design and development team, offering continuous innovation. Dimensions: 19.13W x 12.72D x 37.48H in.. Made of solid and engineered woods. Espresso finish. Horizontal storage for 8 wine bottles. Can hold up to 24 stems. Glass-doored cabinet divided by one shelf. Versatile transitional look. Dimensions: 19.13W x 12.72D x 37.48H in. Satisfy your thirst for great form and function with the glosco wine cabinet. The cabinet is painstakingly crafted of solid mango wood, with a hand-worked surface and richly understated finish that brings out the complexity and beauty of the grain. With plenty of storage and room for nine wine bottles, it s packed with possibilities. Modern Style and Strong Practicability--- This wine cabinet is ideal for office, kitchen, study and resting room for the modern and globe style. You could apply it at any place you want. Gum Wood Construction--- Features from superior gum wood, this wine cabinet is smooth and has no splinter. Refined Painting--- Its outer map painting surface spice up the very concept of wine cabinet, which is refined and graceful. And the inter paint is heaven, which make the cabinet is of vintage. 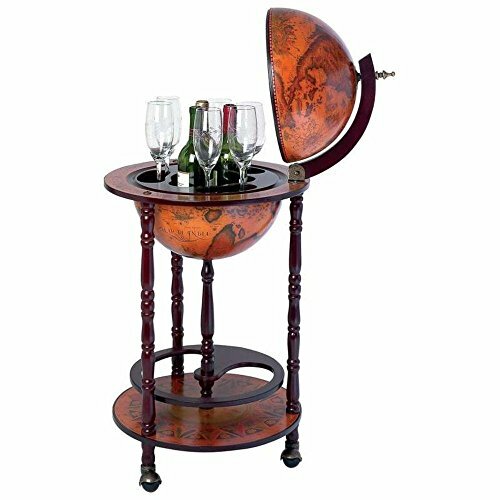 3 Universal Wheels Design--- This wine cabinet features with 3 universal wheels for easy and toilless movement from room to room. Collection of Wines--- For the wine lovers, a suitable and modern wine cabinet is very important to place wines and goblets. 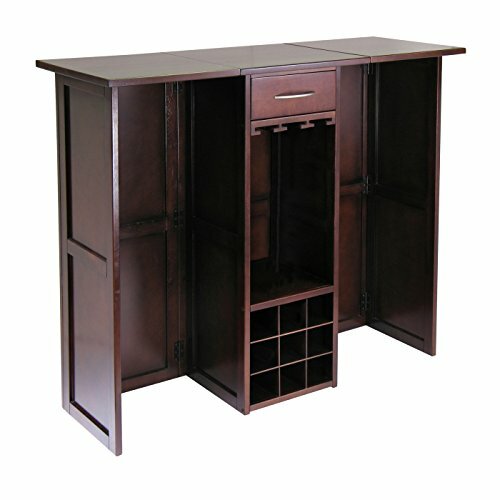 This wine cabinet has 4 rooms and 2 shelves for wines and cups of different size, which could meet your different needs. And the crescent-shaped shelf could be used to place bottle openers or noggins. 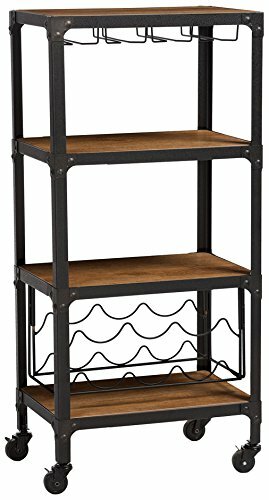 Kings Brand Espresso Finish Wood Wine Rack Console Sideboard Table With Storage. For wine enthusiasts, this Wine Cabinet is a stylish piece of furniture to house your collection of everyday and fine-vintage bottles. This unit features an open storage compartment where you can place wine bottles and two side glass doors to storage wine glasses and more. 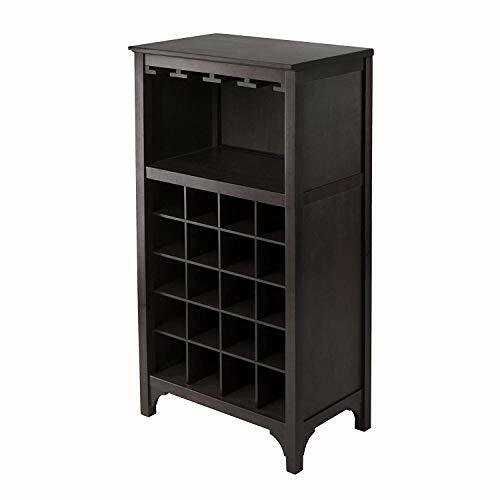 This estate espresso wine cabinet will add a touch of elegance to any room. Dimensions: 30" H x 42" W x 12" D. Simple assemble required. Kings Brand Espresso Finish Wood Wine Rack Console Sideboard Table With Storage. For wine enthusiasts, this Wine Cabinet is a stylish piece of furniture to house your collection of everyday and fine-vintage bottles. This unit features an open storage compartment where you can place wine bottles and two side glass doors to storage wine glasses and more. 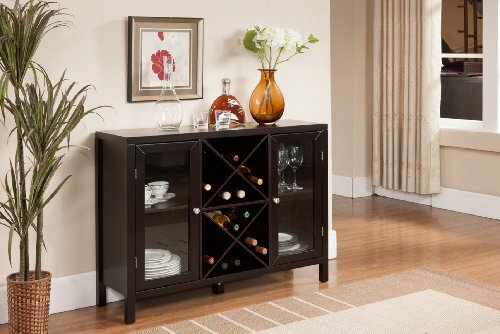 This estate espresso wine cabinet will add a touch of elegance to any room. Dimensions: 30 H x 42 W x 12 D. Simple assemble required. 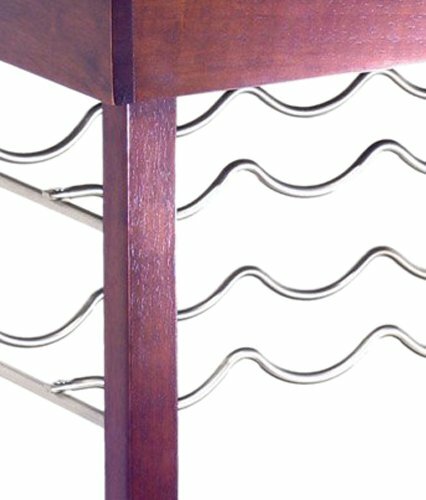 The Larson Wine Stand features a multi-functional design and a tall, slim profile. Use its spacious open shelves to organize and decorate while its built-in wine and stemware glass racks keep drinks and glasses ready for any occasion. Its tiered design captures attention and easily functions as a room divider. 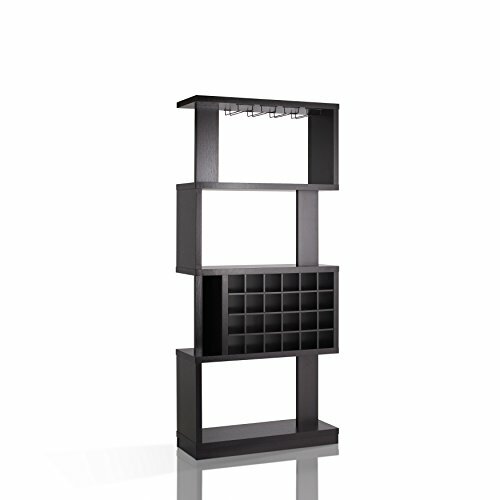 Create the perfect functional space in your home with the Larson Wine Stand by ioHOMES. Ours is 14.2" high NOT 13" and is over 40" high NOT 36"(The Upscale version). You will definitely want this one. BUY NOW limited quantities. Ours is 14.2" high NOT 13" and is over 40" high NOT 36"(The Upscale version). 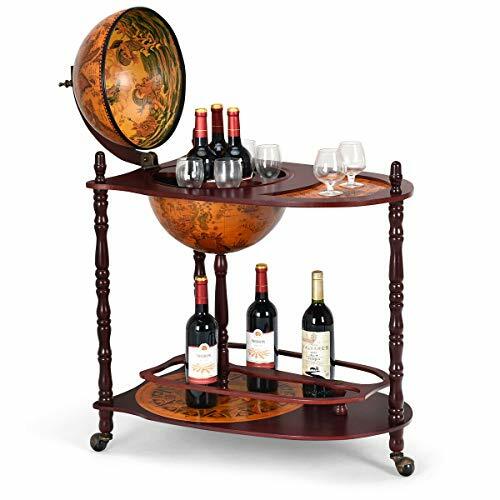 The Santa Fe Kitchen Cart is perfect for entertaining guests and storing your favorite wines. This serving cart is made of a long lasting, solid wood with metal hardware for a clean, attractive look. It features a towel bar on its side, so your kitchen towel will be within your hand's reach. The serving surface on top is sized generously, so you'll have room to place your favorite wines, wine glasses and even some snacks. There's two wine racks below its top serving surface and they can hold up to 10 bottles of wine. There's a bottom shelf that is perfect for store any other goods you wish, from cookware to decorative pieces. This kitchen cart is equipped with rolling casters for transporting convenience. Make your entertaining much more convenient with the Santa Fe Kitchen Cart. The item is a beautiful espresso finish. Dimensions: 30L x 18.5W x 33.25H inches. Winsome Trading has been a manufacturer and distributor of quality products for the home for over 30 years. Specializing in furniture crafted of solid wood, Winsome also crafts unique furniture using wrought iron, aluminum, steel, marble, and glass. Winsome's home office is located in Woodinville, Washington. The company has its own product design and development team, offering continuous innovation. Crafted from long-lasting wood. Features a lower fixed shelf for storage. Holds 10 bottles of wine. Comes with 4 casters for easy mobility. Available espresso finish. Some assembly required. Dimensions: 30L x 18.5W x 33.25H in.. 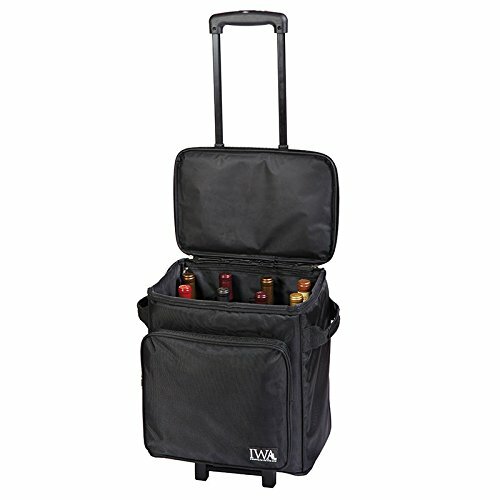 Whether you are going to a dinner party, BYOB restaurant or the wine country, we have the perfect wine carrier for you. Wine Trolley Luggage 12 Bottle NEW (P/N 27151). New and improved, our insulated wine trolley provides safe and easy transportation for up to 12 bottles of wine. Golf enthusiasts and wine lovers will appreciate the quality and workmanship of this wine bottle holder. Golf Bag Wine Bottle Holder (P/N 76-295). 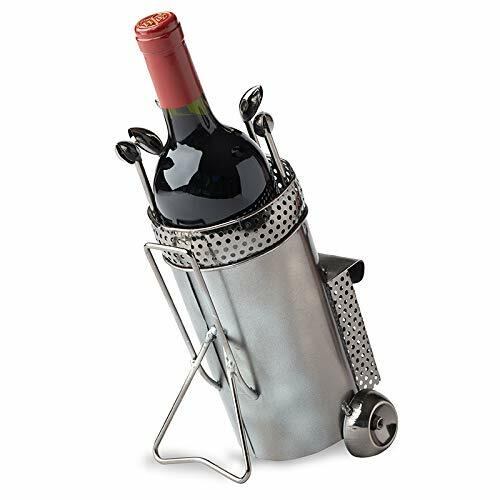 This handsome metal wine bottle holder is shaped like a golf bag and makes a special gift to your favorite golf lover. 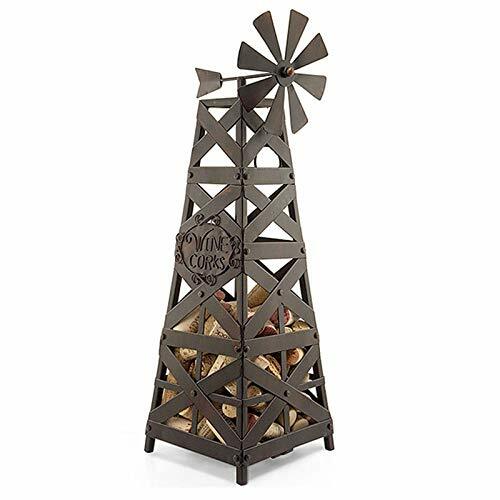 Show off your cork collection in our playful Cork Cage Windmill #27499. 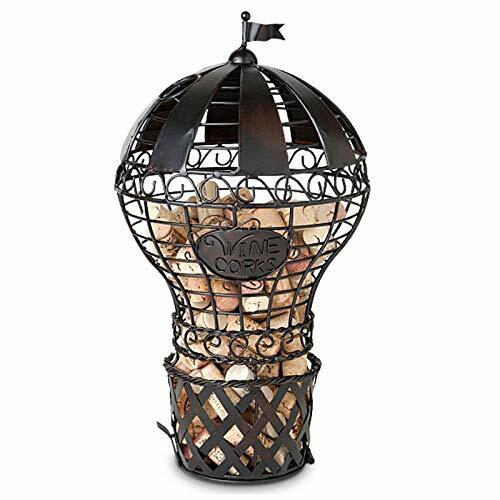 Show off your cork collection in our playful Cork Cage Windmill (P/N 91-072). Handmade from metal and finished with a soft patina, our Cork Cages feature whimsical multi-colored glass accents and a hinged door to easily add corks. Genuine leather wine bag provides an elegant gift that will be cherished for years. New and Improved! 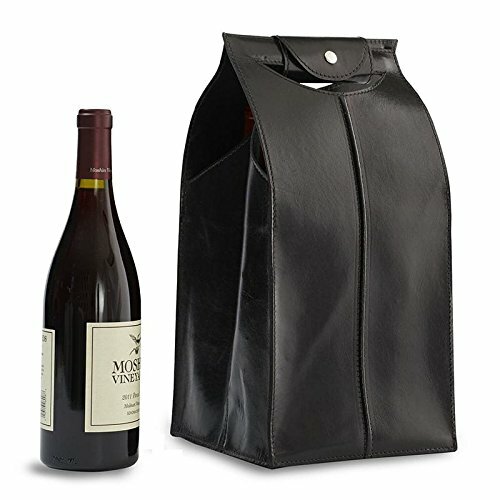 Leather Wine Bag Black 4 Bottle (P/N 25684). Carry 4 bottles of your favorite wine to a restaurant, dinner party or as a gift in this chic leather tote. Our new bags come with dividers to keep the bottles separated inside the bag, and the snap enclosure is sewn to the handle so it won't get lost. Show off your cork collection in our playful Cork Cage Hot Air Balloon #27503. Show off your cork collection in our playful Cork Cage Hot Air Balloon (P/N 91-066). Handmade from metal and finished with a soft patina, our Cork Cages feature whimsical multi-colored glass accents and a hinged door to easily add corks.